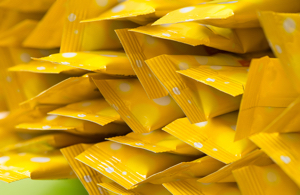 Sachet applications, whether paper, synthetic or metallised multilayer substrates, have seen an increase in popularity within the UV flexo market in recent years. We offer an extensive choice of Food Packaging Complaint (FPC) or non FPC ranges to meet global brand owners, retailers and end users requirements. Through extensive innovation and development we have produced a range of complimenting coatings, delivering a variety of finishes. For more information on the ideal ink and coating solution for you, please take a tour through the ink range links and our complete product guide. Individual product TDS information can be accessed from the downloads tab. If you would like to speak to one of our technical experts directly, then please contact us.